KRA Jewellers Pune (Krishna Rajaram Ashtekar & Co Jewellers), Pune published a new job notification for Counter Sales Advisor Posts. The willing candidates are informed to see the latest notification March 2019. Qualification required 12th Pass and More. 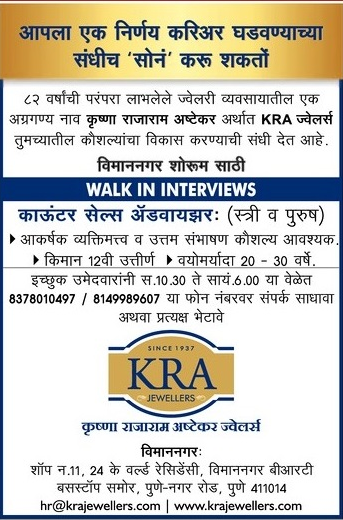 For More details of KRA Jewellers Pune Recruitment 2019 Read Below. Interested & Eligible candidates may attend for walk in interview along with all the documents addressed at शॉप न.११,२४, के. वर्ल्ड रेसिडेन्सी, विमाननगर बीआरटी बस स्टॉप, समोर, पुणे-नगर रोड, पुणे – ४११० १४.